And now for a final (and favorite) stitch combination. The Fern Stitch lends itself to many stitch combinations that you’ll find my new book, Joyful Stitching. It evokes the shape of leaves, climbing vines, or even a bird’s tail feathers. In the Rare Songbird project, three vertical lines of Fern Stitches are outlined in Stem Stitches using the same orange thread. French Knots, in a light blue thread, fill in the spaces between to make a decorative tail for the bird. 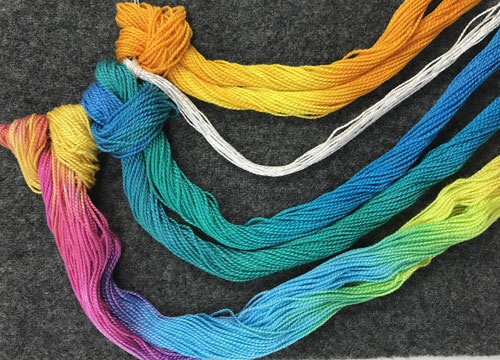 I hope the examples of stitch combinations we’ve reviewed in the last few weeks will come in handy and add to your own free-form stitchery arsenal. May your combinations always rock! It’s true what you’ve heard. A chapter in my new book, Joyful Stitching, was mysteriously removed before publication. Sure, I’m making this all up but the chapter called Combinations Rock! was a great idea! It was all about combining embroidery stitches and included the merging of stitches to create texture on fabric. A good example of this texture building is found in the Tasty Bite of Apple project. Adjacent rows of Blanket Stitches create small squares like the light green threads above. Each green square is filled in with a red French Knot. This is my favorite stitch combination. 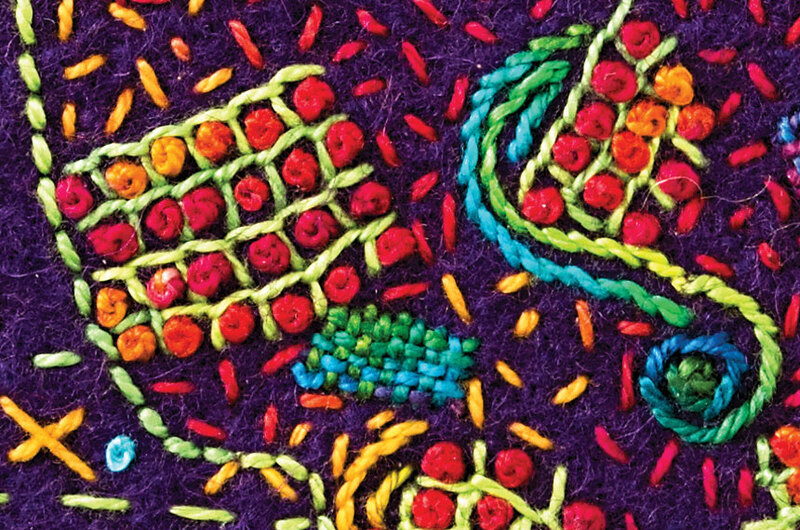 I love how the bumpy texture created with complementary thread colors really zings. Don’t you just love a bumpy combination? 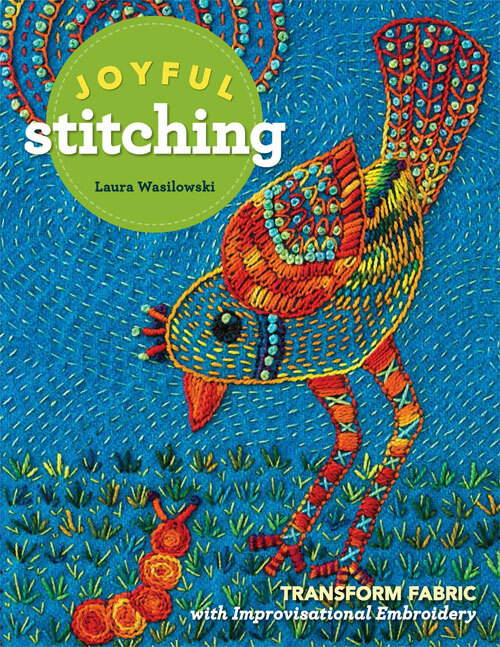 Did you know that there is a missing chapter from my new book, Joyful Stitching? Yes, it mysteriously disappeared one dark and stormy night. This “tell all” chapter (with the cheerful title Combinations Rock!) was mysteriously dropped from the book. Some say it was due to lack of space. I say, that they were scandalized by my combinations rocking. Combinations Rock! explored the combining of different embroidery stitches to create texture, pattern, and shape on fabric. Happily I have saved my notes and have examples of that missing chapter to show you over the next few days. Hope you’re not scandalized! 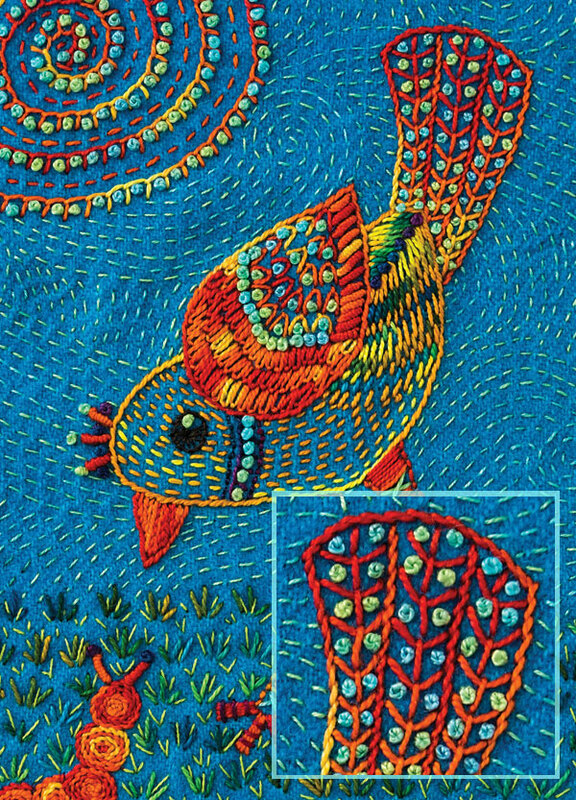 It’s common practice in hand embroidery to combine stitches to create pattern. 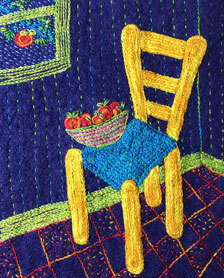 Repeated stitch motifs or patterns are useful for filling in large background areas like the table in Embroidered Pear. This pattern of embroidery begins with rows of linked Cross Stitches in blue thread on the wool background fabric. The blue threads make diamond shapes across the fabric. French Knots (in yellow thread) fill in the diamond shapes to complete the pattern. 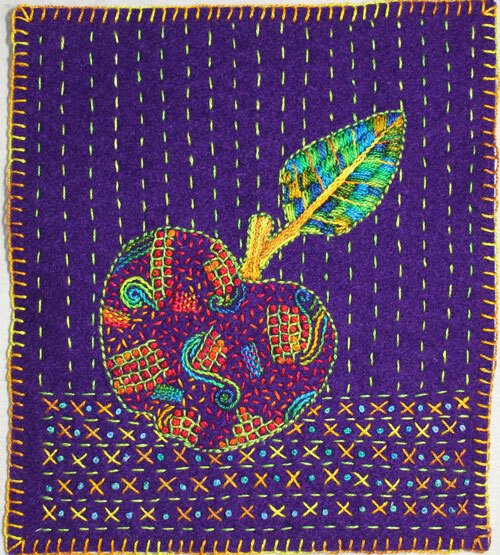 This simple stitch combination builds a delightful pattern across the fabric and keeps that pear from falling over. Stay tuned for more combinations rocking in the near future! Ready for another Stitch Along? Using techniques from my new book Joyful Stitching, I’ll show you step-by-step how to make this lively paint brush. It only uses 7 hand embroidery stitches and there is a pattern ready for you to print and trace. There is also a Stitch Kit available for the Paint Brush Stitch Along. 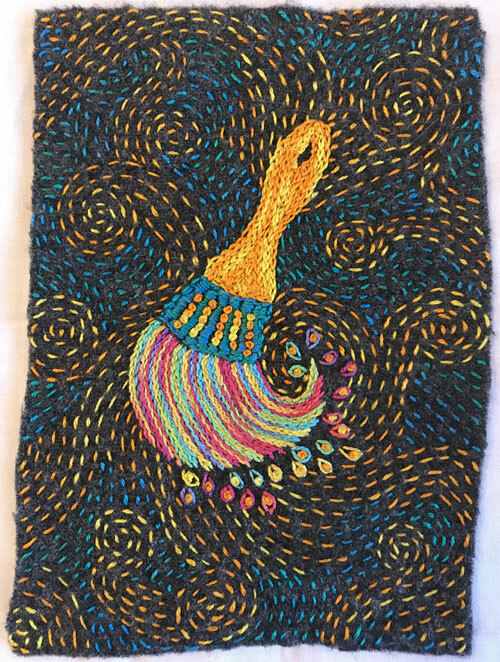 You can select one or all of the items to make the brush: the wool background fabric, hand dyed threads, and embroidery needles. Click here to begin your Paint Brush Stitch Along. If you can’t join the Stitch Along today, you can always find it and other Stitch Alongs here under Tutorials. I am delighted to show you this version of the Yellow House Landscape project from my book Joyful Stitching. It was stitched by Janet. Janet has written a series of posts about her process and the changes she made to suit her methods of stitching. You can read about it here on her blog, Embroidery Muse. For all you other radical stitchers out there, you’ll find a final chapter in Joyful Stitching called More Ideas for Free-Form Embroidery. 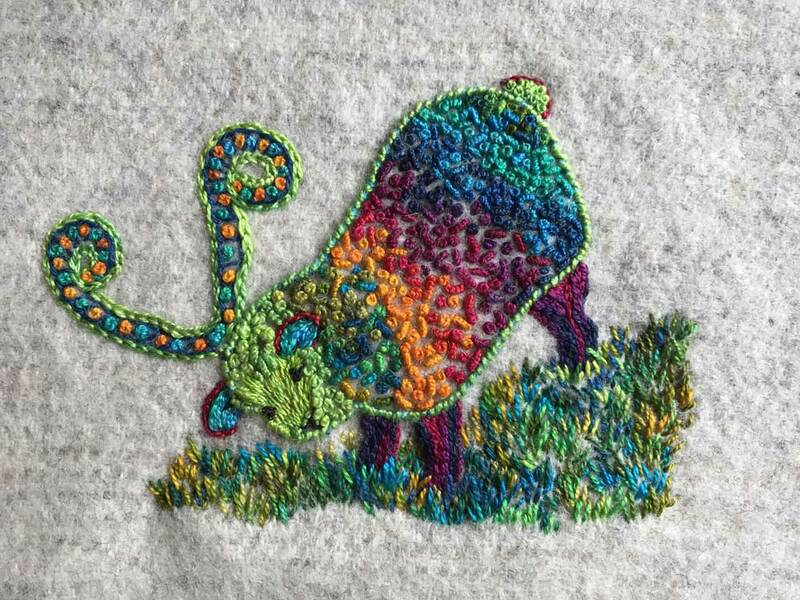 Free-form embroidery is all about choosing stitches and stitch combinations to create original art work in an improvisational manner. 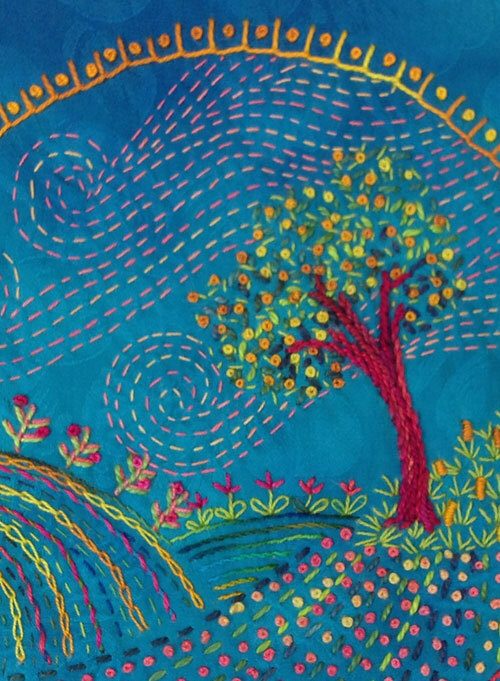 There are no patterns or directions for the eight improvised embroideries in this chapter. But I do discuss the importance of background fabrics, variations on a stitch, and creating the stitch motifs and patterns found in the free-form embroideries. The eight projects also demonstrate different ways hand embroidery can create texture, shapes, and line. Most importantly, the More Ideas for Free-Form Embroidery chapter is about inspiration. It’s purpose is to trigger your next embroidery design and inspire even more joyful stitching. And speaking of joyful stitching, the lucky winner of my new book, Joyful Stitching is Ellen L.